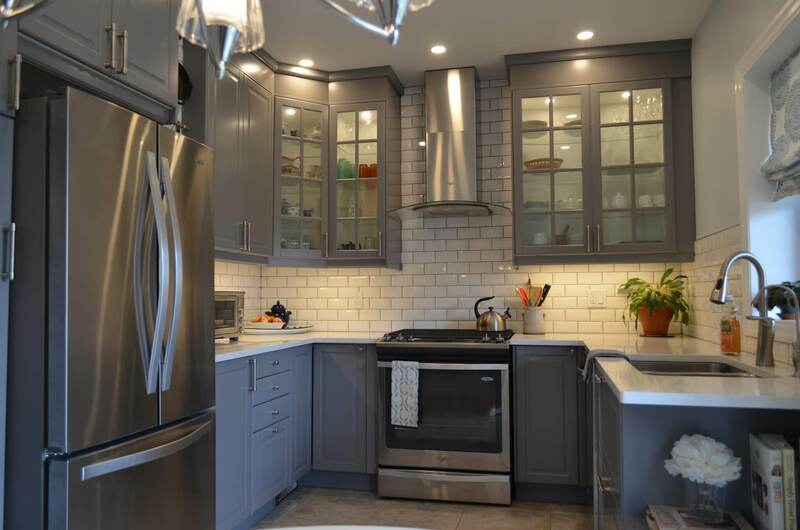 This kitchen had a lot of negatives and few positives going for it: dark brown cabinetry, doors & drawers that didn’t open, an awkward layout, lack of light, poorly insulated walls & no dishwasher. 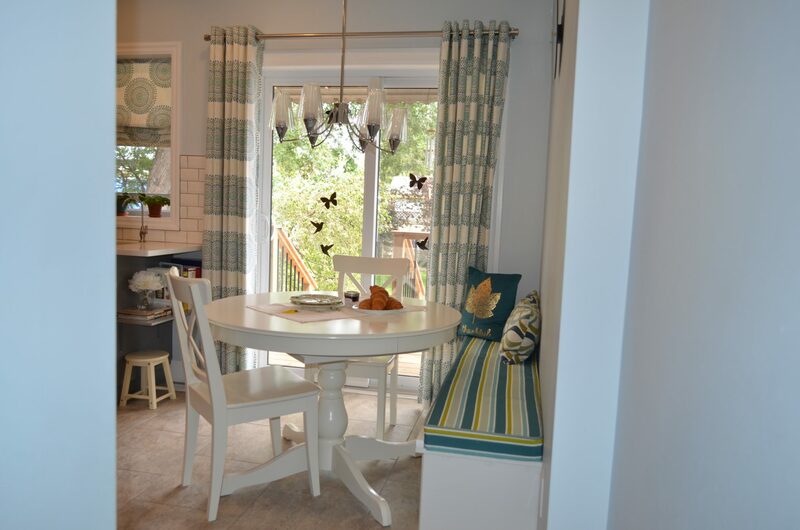 Working with the contractor, the room was taken right down to the studs, insulation was put in & the room rewired. 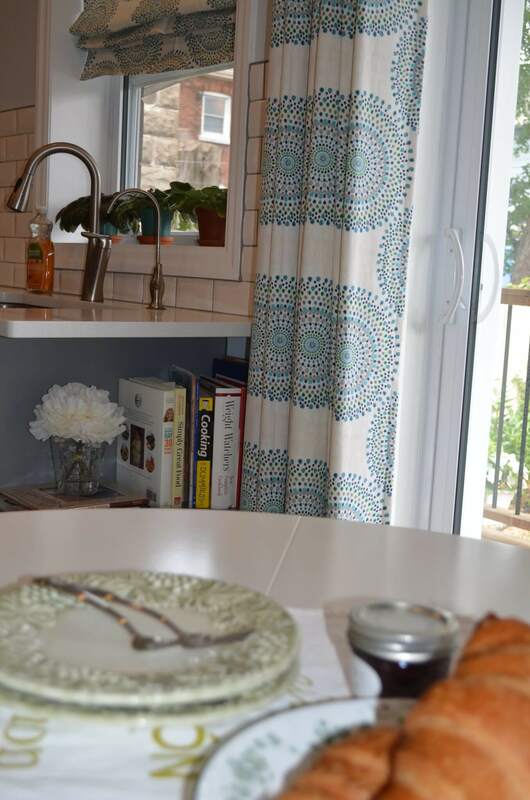 To create better flow, a window was removed and replaced with sliding glass doors, and the original door replaced with a window allowing us to install the maximum amount of cabinetry and increase light exponentially! 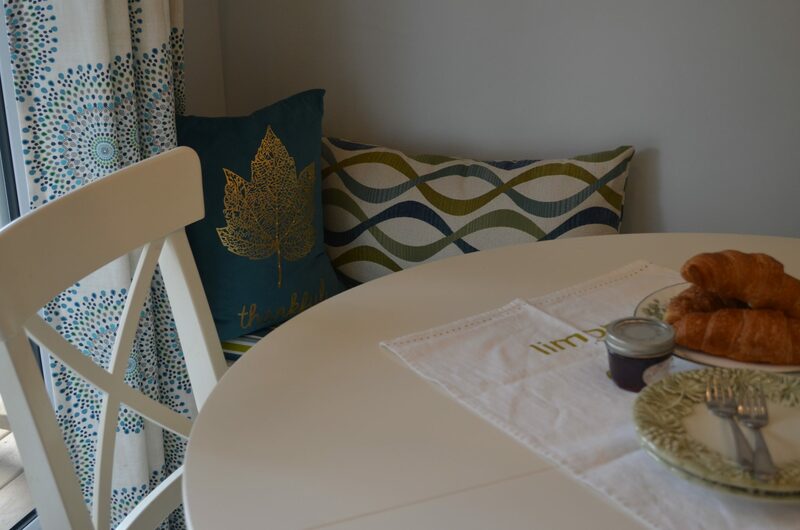 We maximized every inch we could to make this space functional and bring in as much storage as possible—even the banquette was outfitted with drawers for craft supplies. 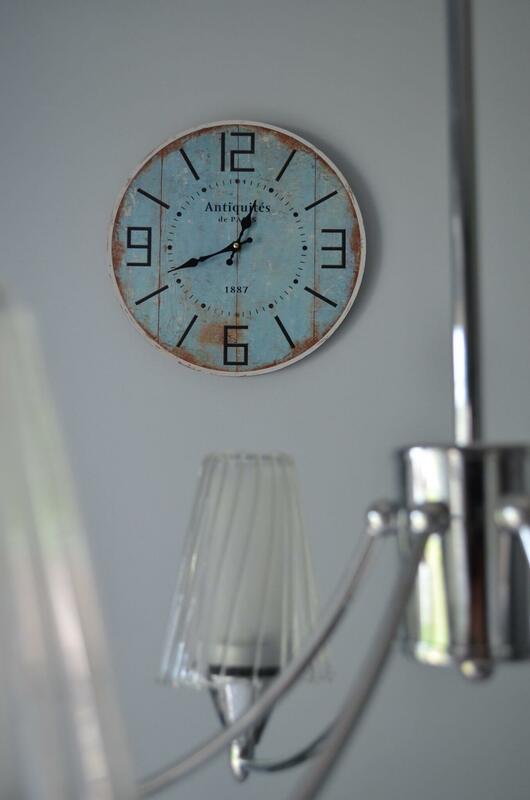 Once the layout had been decided, then we moved on to finishes. 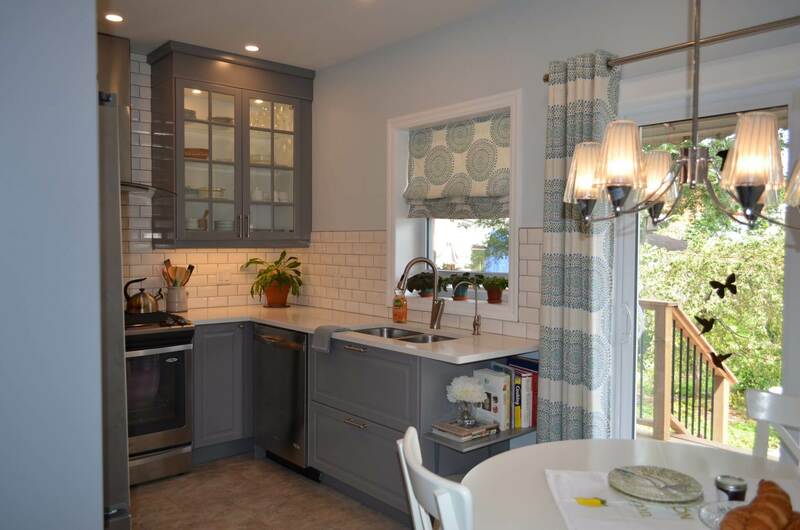 We wanted to work with the character of the older home, but also create an open and bright space. 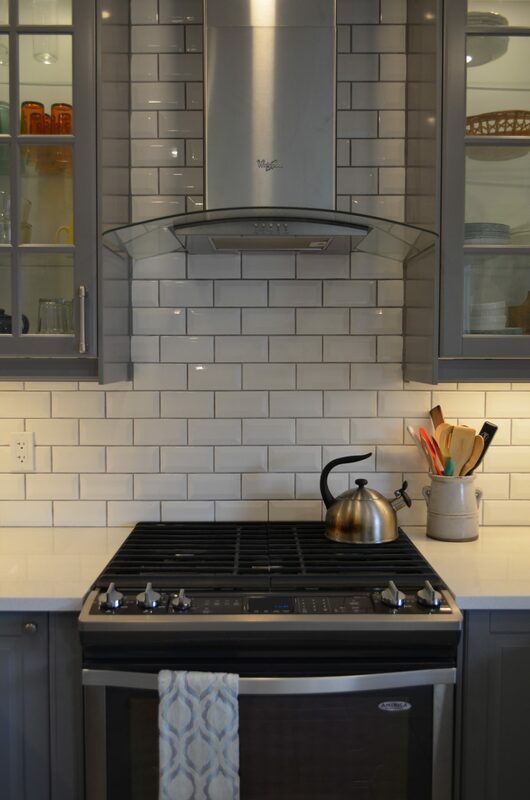 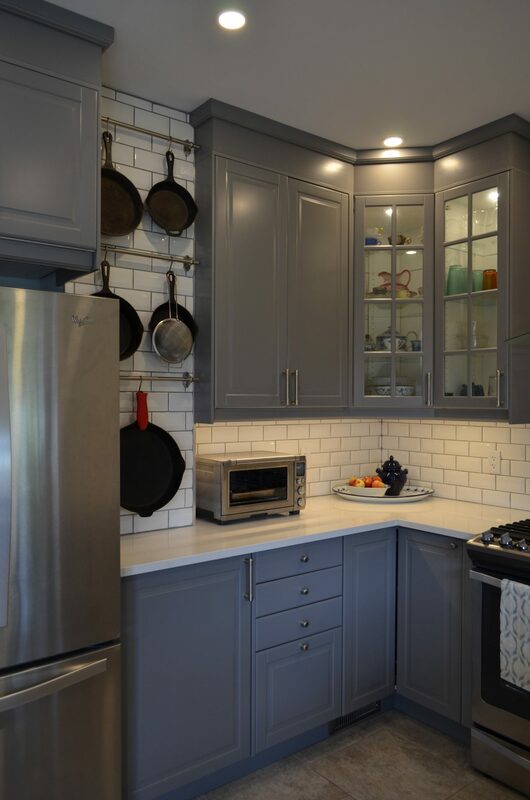 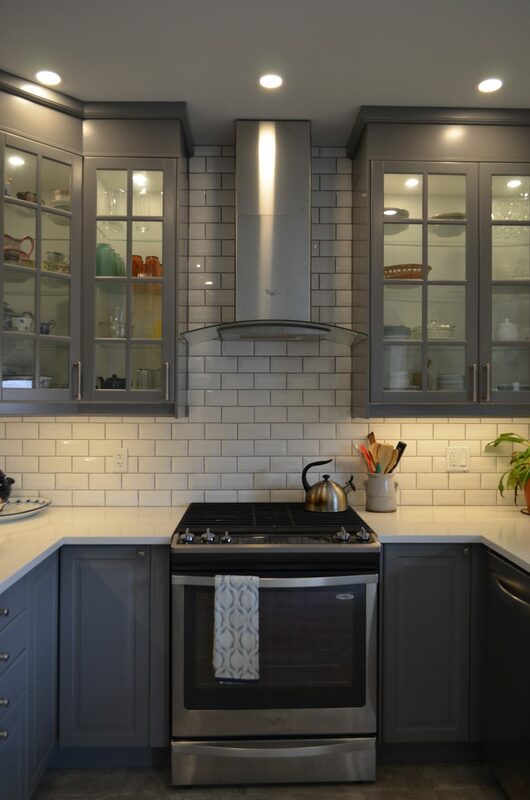 Soft gray cabinets were chosen, and to keep things from looking too heavy, the upper cabinetry was outfitted with glass doors, no uppers were placed over the stove, and the wall with the window was left bare. 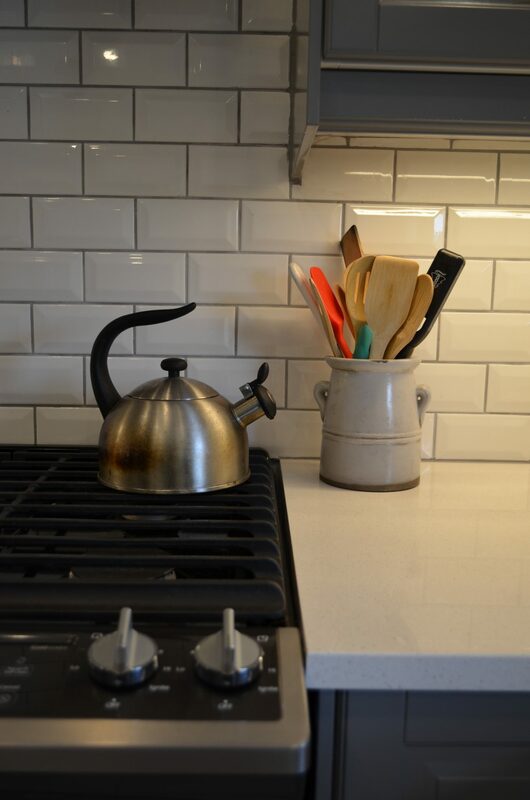 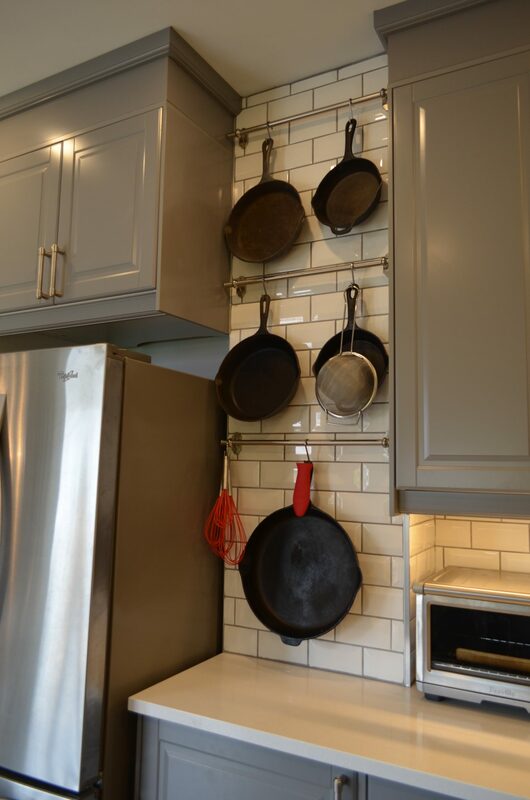 The homeowner had an extensive cast iron pan collection that she uses on a regular basis, so we created a spot that creatively stored these pieces. 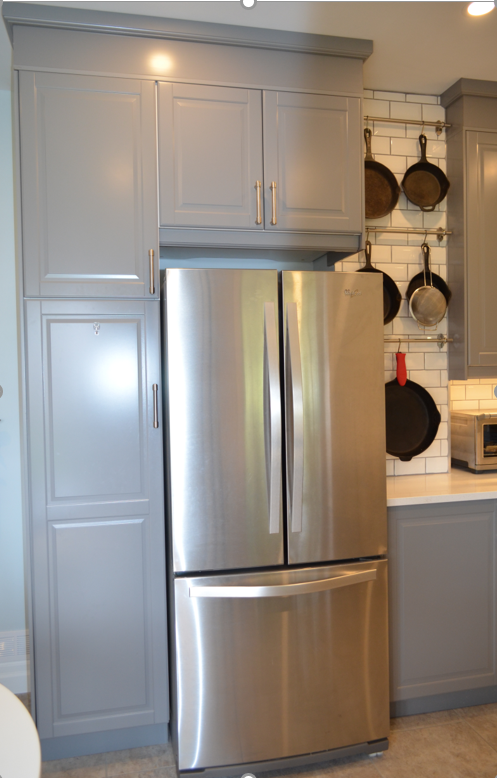 Stainless steel appliances were chosen to blend in with the cabinetry (yes, there is now a built in dishwasher), and a luxury vinyl tile covers the floor—a warmer choice than the traditional porcelain tile. 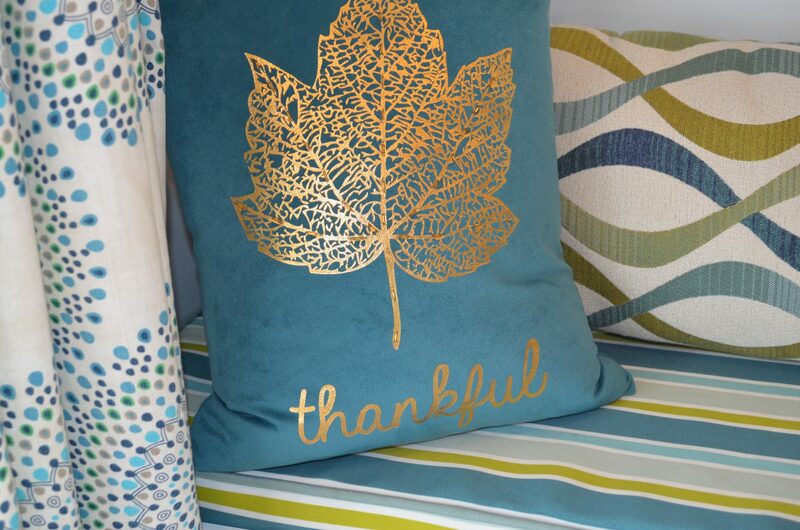 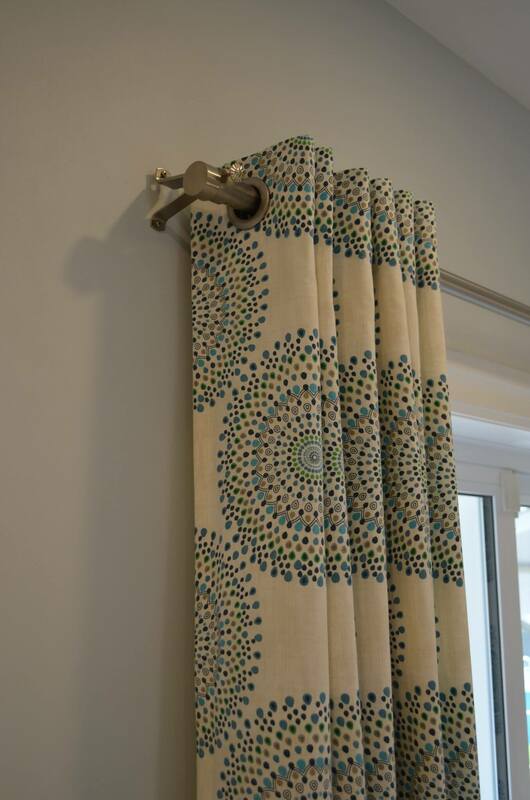 Custom drapery panels and a striped cushion for the banquette add softness and pull the whole look together bringing in pops of turquoise, aqua, and green. 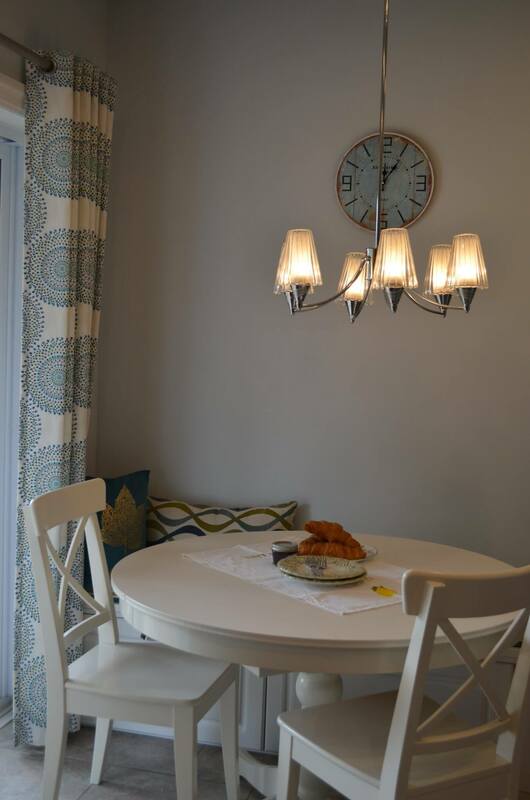 A soft blue paint was chosen for the walls, a simple chandelier was hung, plus throw cushions and a vintage inspired clock were added to the eating area to complete the space. 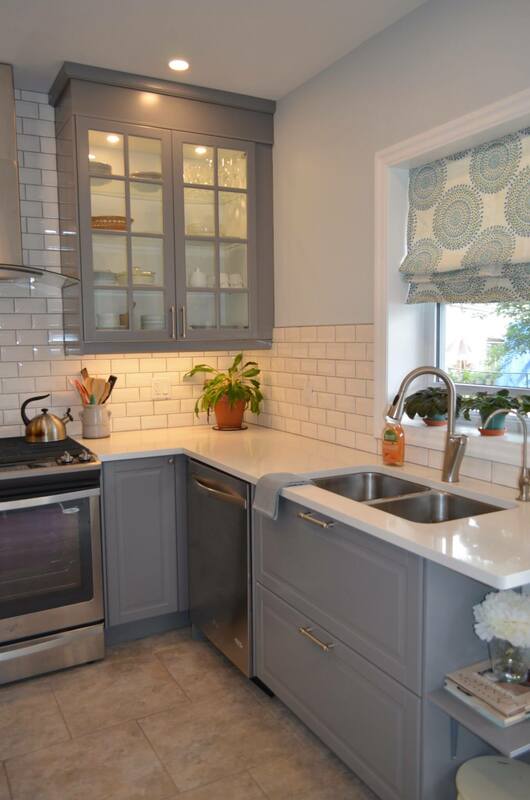 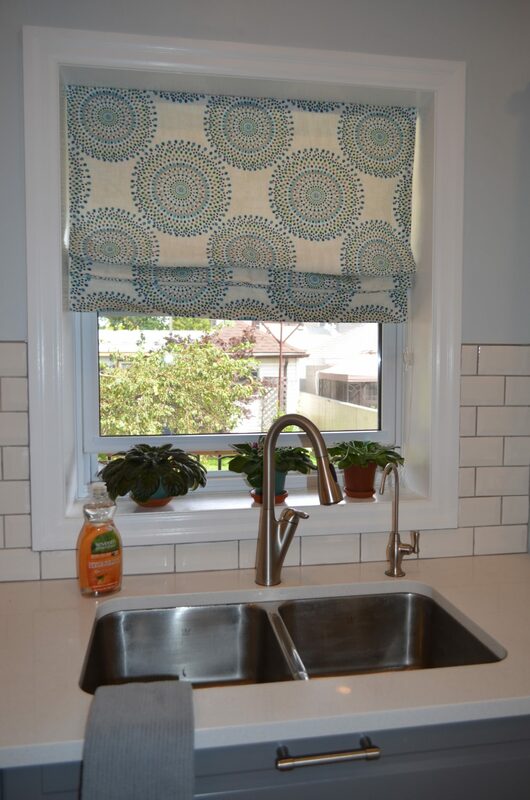 The homeowner is more than thrilled with the results and now loves to be in her kitchen!